Distinctive features: A popular, low-cost model. Four function, memory, scientific functions. Integrated circuit - Texas Instruments TMC0981. 78 x 146 x 35 mm (4.0" x 6.25" x 1.25"). Made in various countries including USA and Italy. Inside howing the circuit board with just the TMC0981 integrated circuit and the LED display. Note how this calculator retains the case shape that Texas Instruments had been using for the last few years and with the shrinking size of the electronics it does not make very efficient use of space. Texas Instruments started research into portable calculators in 1966 with the "Caltech" project, and went on to supply calculator electronics components to many companies. In 1972 it started to market it own calculator, the TI-2500 Datamath, which was the first of many models. 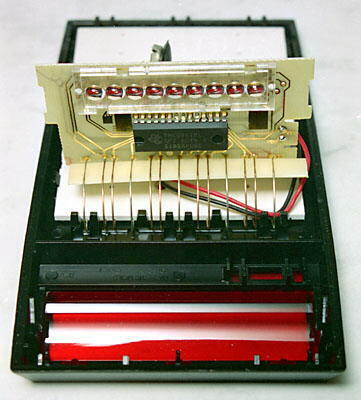 By 1977 it was possible to include scientific functions and memory in a basic calculator, all based on a single LSI integrated circuit. 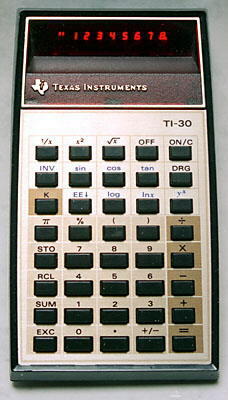 The TI-30 was among the most popular of all LED calculators and was manufactured into the 1980s. The cost in 1977 was US$24.95 [about £14.60 GBP]. Texas Instruments is one of the few early manufacturers which is still in the calculator market.